This bag is Asian inspired with hand painted bamboo stalks.We used Metallic Gold and Black to give this design a truely 3-dimensional look. This design will compliment your entire wadrobe.The gourd base color is left natural and the veg tan leather straps are natural. Like all of our bags you can have this one with a handle or the leather strap. 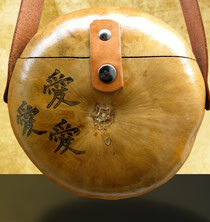 This handbag has the beauty of Chinese language conveyed in the characters. The gentle lines and curves makes this language an art form. These characters represent "Love"..so we tripled them because love in triples equals more love. 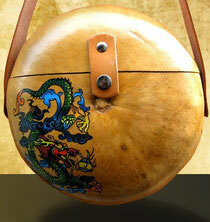 The japanese Dragon art on this handbag is full of color and movement. Japanese dragons are diverse legendary creatures in Japanese and Chinese mythology and folklore. this design has images of sea gods and snakes. I love how the vibrant greens, blues, oranges and yellows play against the natural tones in the gourd. 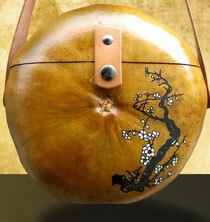 This gourd handbag has black and white cherry blossoms the gracefully hug the sides. the cherry blossom is a emblem of good fortune and love. 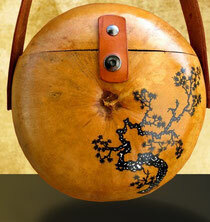 You will definitely love this bag for a lifetime. 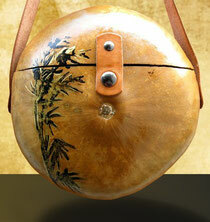 This gourd handbag is tres beautiful and graceful. The woodburned vines and leaves twist and turn on the side. they have a natural flow as they mingle in and around this gourd. The artwork is against light brown color and the finish is a smooth satin gloss. 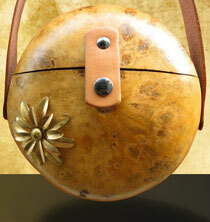 On this gourd handbag we used a Natural brass flower with three dimensional petals. 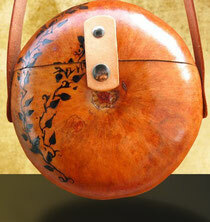 The flower is truely enhanced by the natural finish of the gourd but it would look wonderful on the darker finish. 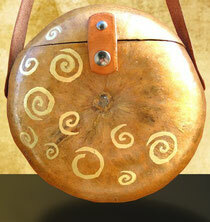 The celtic spirals circle around this gourd.Celtic Spirals have been used on ancient attifacts for centuries. They represent ethereal energy, balance, progress and growth. We usd 18k gold to make the spirals in different sizes. I love the way the swirls and curls are interweaved. 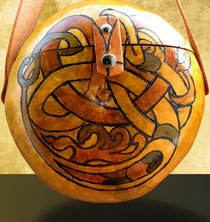 They give this handbag a very 3-dimensional look. The image is wood burned. We used various earthtones inside of the image.